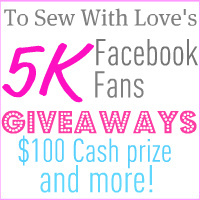 To help celebrate my friend, To Sew With Love, reaching 5k facebook fans, we're having a giveaway for one (1) $100 Paypal cash prize! This giveaway is open worldwide. You should be 18+ and have a paypal account. This giveaway will end on May 10, 11:59 PM EST. Good luck everyone and have fun! And be sure to come back on May 3 for another To Sew With Love-Whirlwind of Surprises team-up giveaway! Enter on the Rafflecopter form below so take your time and come back to finish when you have time! Please take the time to check out our other giveaways while you're here. I'd put it toward our vacation. I'd go shopping with my mother. I need a new car stereo. I'll use it towards birthday presents for family. I'd probably buy something for my kids. I'd buy my boyfriend and I a nice dinner out. Hello, I'd use it for a nice spa weekend I'm saving up for.thank you! its use it on a birthday present for my momma! I would use it to buy some new curtains for my kitchen. i will buy a new computer monitor! I would buy my children some new clothes! I wold put some money towards a gift for myself and my mother and some gas money. I would buy portable kitchen mixer for my baking tools. I would buy a gift for mother's day and lots of books. Oh anything goes towards rent. I will pay a couple of smaller bills i.e. cell phone and utilities. I would buy my daughter some much-needed Summer clothes. I'd use it towards textbooks. put it towards a great anniversary present for my parents!